A cherry blossom is the flower of any of several trees of genus Prunus, particularly the Japanese cherry, Prunus serrulata, which is called sakura after the Japanese. 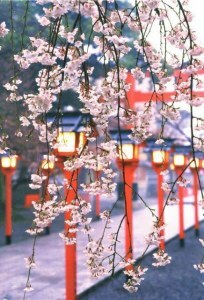 Cherry blossom is speculated to be native to the Himalayas. Currently it is widely distributed, especially in the temperate zone of the Northern Hemisphere including Europe, West Siberia, India, China, Japan, Korea, Canada, and the United States. Along with the chrysanthemum, the cherry blossom is considered the national flower of Japan.